My second son, D, called me on the Friday before the ice/snow came last winter. He was sick with the flu and had my nine month old grandson to care for. C, his wife, had to work because of limited sick time from her time out with bronchitis and strept throat. C’s job is away from home during the day and D’s job starts between 3 and 6 PM as a Data Base Analyst, so he works on line from home usually. D and C have a small farm with chickens, a few ducks, and five pygmy goats: two males, one female, one mother with her two month old kid. Normally these animals are very hearty and when given some shelter can do very well even in very cold weather. It was supposed to be in the teens the first night. So I packed up everything figuring I would be gone 4 to 5 days. I didn’t have time to get a cat sitter, so my two cats came too. (One of my cats has asthma, the other has problems with digestion and both require medicine.) Little did I know that that long week end was going to be one filled with fun, surprises, beauty, sadness, challenges, and triumph. After we ate lunch D laid down for a while. Then I got to enjoy being a grandmother. Grandson L and I played with toys, played with fingers and made funny noises. I sang to him and talked to him. Finally he was ready for his nap and went to sleep. D got a good three hours of sleep in and looked like a new man. I, of course, happily continued my grandmotherly duties till C came home. That night it started snowing and sleeting. We awoke to icy snow blanketing the ground. In the morning the large empty tobacco field next door was beautiful and white but all was frozen. C went out to check on the animals. I stood at the back door in case she slipped on the icy ground. A few minutes later I heard C yelling as she ran toward the house, “We need some towels. Tell D to get the space heater!” We gathered around her as she toweled off the two month old kid. 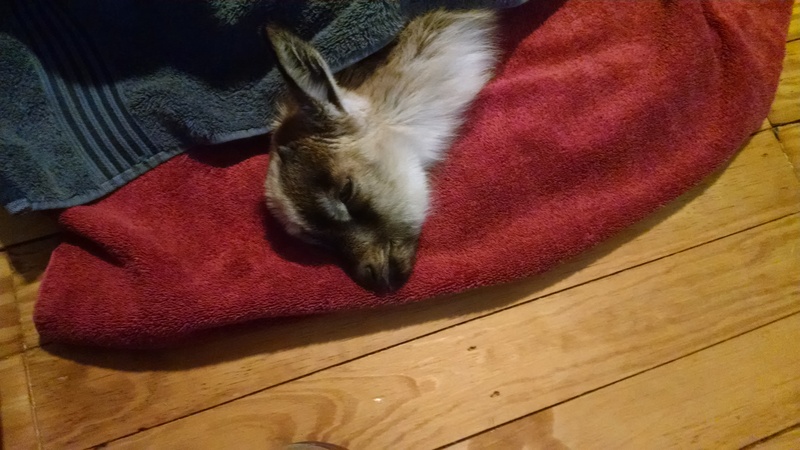 C found her with her mother standing over her, still breathing but one icy, cold, baby goat. Two month old sick kid. During the day the goats were let out of their fenced yard to graze, exercise and enjoy some freedom. The foraging was scarce though and they returned to their pen for the hay and straw later. The kid behaved strangely; arching her neck then letting her head fall back on her neck. Sometimes her legs were moving like she was trying to get up. I had seen a dog’s seizure and thought the baby was ‘paddling” like with a seizure. But warming the baby was our top priority. Later that afternoon C and I decided to let the mother goat come in to see what would happen. The baby happened to bleat as the mother goat got close to the house which made the mother goat gallop toward the baby. 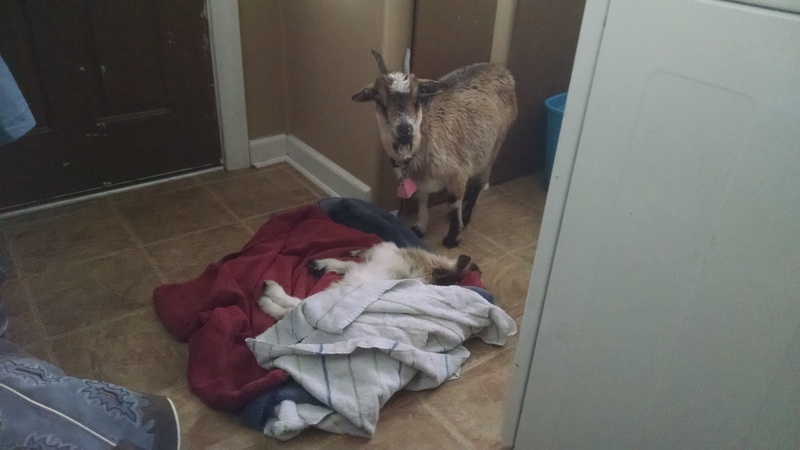 Mother goat with baby in the laundry room. Sadly the baby just lay there and bleated. The mother sniffed at her baby for a few minutes. Then started looking around at her surroundings and walking around. The baby couldn’t stand to nurse and the mother couldn’t help her. So we took the mother back out to the pen. The baby’s mouth remained cold and blue, even though her body was finally warm. This may have been a sign of shock. But the baby began to drool and her condition worsened. We all agreed to put her out of her misery. I held a flashlight for D as he mercifully shot the little goat and buried her. On Sunday the ground was still quite icy but C went out to check on the goats. The mother goat had died. The two males and one remaining female looked sick and there was puke all over the straw. Goats have four stomachs and ruminate sort of like cows do. Vomiting was a bad sign. We were pretty much iced in so we couldn’t go anywhere. But between C, D and I, we reasoned that if we gave them some vitamins and antibiotics, maybe it would help. We had nothing else to try. There was some of each which I squirted in the last three goats’ mouths while C held their jaws open. We continued our research on Google and reached out on Facebook for anyone with experience with goats. To make a long story short with the help of two different Facebook friends we figured out what had happened. The goats had eaten the only leaves available due to the icy ground. The leaves were on an azalea bush at the corner of the house. Azalea leaves, as well as rhododendron leaves are toxic to goats as well as to deer and other creatures. A very small amount can kill them. I went out and found the bush’s leaves and saw where they had been nibbled on. I think that the goats may have managed to vomit most of the toxic leaves out somehow. After raking up the soiled straw, we gave them fresh water and straw that Sunday along with some oatmeal mixed with molasses. They all seemed to have perked up some the next day, Monday. But the youngest male goat shook his head a lot, which was a potential sign for neurological damage or behavior from the toxins. Tuesday I left to return home since the roads had cleared. C told me all of the remaining goats were doing great! It’s funny how my being a human nurse, could help with caring for goats. It was also a wonder that a friend of a friend had goats and could give us advice on their care.This was another snowy experience to add to my list! Wow, what a weekend you had. It sounds like you barely had time to catch your breath. I believe that I will never forget that weekend! Actually by Monday and Tuesday before I left everything was much calmer. Thank you for commenting, Bernadette. Happy New Year!! I am so sad about the little goat. Glad the others are OK.
We all were sad too. It was a wonderful feeling to hear that three of them made it. Thanks for your comments. Oh my what an experience. You did well to not let the little one suffer more than necessary. Thank you. It hurt me more to see him paddling and calling for his mother(?). I can not abide the suffering of anything. I was thankful we could save the other goats. Oh my. I love life on our farm but the sadness over animals at times is so tough. I’m sorry about the little guy. I’m sure your presence has been one blessing right after another for your family. I don’t know what we would have done without loving family and friends when our human kids and we parents all got sick or overwhelmed. Enjoy that grandmother business. I hope to do some day. As of now, our grandpets will do. Thank you for your sweet comments. I have always loved animals and since I was a nurse, some knowledge overlapped. My daughter in law wanted to be a vet originally. So the goats were in pretty good hands. LOL.